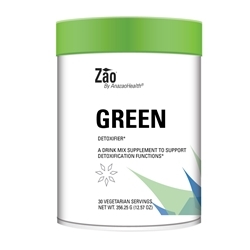 Detoxifier- A drink mix supplement to support detoxification functions. * Vegetarian. Mix 1 heaping scoop (11.88 gm) daily in 8 oz. of cold water or juice or as directed by your health care practitioner. Each scoop (11.88 Grams) contains: Calories 26, Fat Calories 0, Total Fat 1 g, Sat. Fat 0 g, Cholest. 0 g, Sodium 40 mg,Total Carb. 6 g, Fiber 5 g, Sugars <1 g, Protein 0 g Soluble Fiber (Fibersol-2™ brand) 2,000 mg, Soy Lecithin Powder 1,500 mg, Spirulina 1,000 mg, Barley Grass Powder 500 mg, Oat Beta Glucans 500 mg, FOS (Fructooligosaccharides) 500 mg, Carrot Powder 400 mg, Bromelain (80 GDU) 360 mg, Papain 300mg Red Grape Seed Extract 300 mg, Chorella-Cracked Cell Powder 250 mg, Wheat Grass Powder 250 mg, Red Raspberry Powder 250 mg, Apple Pectin 250 mg, Acerola Berry Juice Powder 200 mg, Alfalfa Powder 200 mg, Beet Juice Powder 200 mg, Cauliflower Powder 200 mg, Flax, Seed Meal 200 mg, Parsley Juice Powder 200 mg, Rose Hips 200 mg, Spinach Leaf Powder 200 mg, Non-Dairy Probiotic Culture (1.2 Billion C.F.U.) 200 mg, Royal Jelly 150 mg, Bee Pollen 100 mg, Citrus Bioflavonoids 100 mg, Blueberry Powder 100 mg, Broccoli Powder 100 mg, Cranberry Juice Powder 100 mg, Horsetail Rush 100 mg, Bilberry Extract (25 % Anthocyanidins) 80 mg Milk Thistle 60 mg, Rosemary Leaf Powder 60 mg, DMG HCI 50 mg, Grape Seed Extract 50 mg Green Tea Extract 50 mg, Eleutherococcus senticosus (Siberian Ginseng) 50 mg, Aloe Leaf Powder 50 mg, Stevia 35 mg, Licorice Glycomil 5 mg. Other Ingredients: natural apple flavor, cinnamon powder.